The EU Parliament offices in Dublin’s Molesworth Street was the setting for a discussion about, not just our objectives as Europeans, but our collective vision for development in the post-2015 environment. 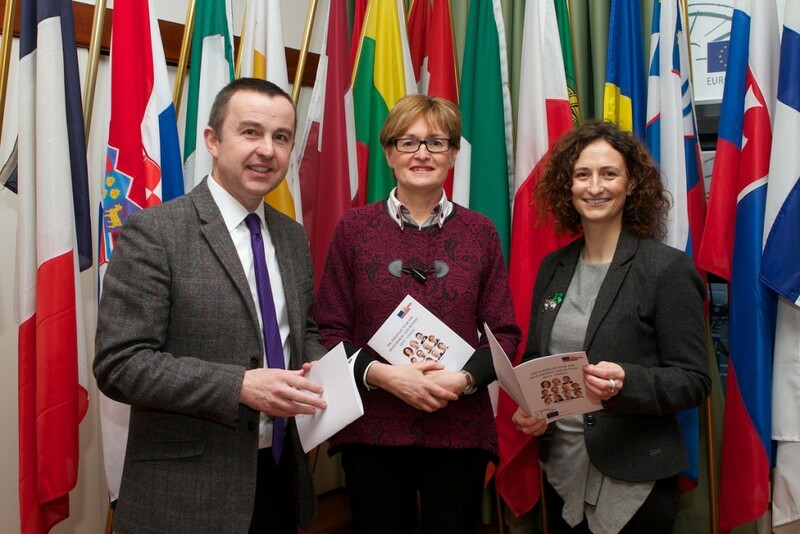 Ahead of the official launch of the European Year of Development (EYD2015) at Dublin Castle, the gathering provided an opportunity for Ireland’s MEP’s to outline their perspectives and identify what they see as priority areas. Brian Hayes (MEP for Dublin) spoke about the significance of the market in developing countries, quoting OECD figures which suggest it could be worth as much as €30.5 Billion over the next five years. A priority for Ireland he suggested, was the need to set a road map for getting back to our development funding target of 0.7% of GDP. In his official statement he argues that that we need to adopt a greater urgency in getting things done, especially as they pertain to the lives of vulnerable children; adding, “we need to invest in preventing child under-nutrition now”. In her official statement, Mairead McGuinness (Dublin), vice president of the European Parliament and Children’s Rights Mediator; also highlighted our collective failure to eradicate hunger, particularly as it effects children; “some 23,000 children die every day due to lack of nutrition – it is a shocking statistic”. According to the WHO, she added, “2.6 million children under the age of five die every year due to under-nutrition”. Lynn Boylan(MEP for Dublin) argued that Europe should be looking to move away from large-scale farming initiatives with their heavy emphasis on the use of pesticides toward an “agro ecology” model, or, small scale farming, which she suggested was a better route toward creating sustainable development to benefit local communities. Alongside this, she argued, Europe needs to encourage more equitable polices that provide better incentives to develop sustainable economies. A number of delegates at the meeting spoke about on-going humanitarian concerns, primarily in Gaza, where infants have recently died of exposure, arguing that it necessitated a much greater level of focus. Mr Hayes and Ms Boylan referenced the need for Europe to seek recompense, or accountability, for the destruction of EU tax-paid infrastructure there. Contributions were also provided by Sean O’Connell of Young Global Advocates who cited polls indicating that Europe’s young people retain a strong interest in the development agenda. Mr O’Connell suggested an emphasis going forward on growing the “social economy”, or what he characterised as the “third economy”, after the public and private, and further to that, more “consumer activism” with consumers making informed, ethical choices when purchasing goods and services. ChildFund Ireland are pleased to see the significance placed by many MEP’s, including Sean Kelly (MEP for Ireland South) on the need to address issues affecting children’s lives, as a matter of urgency. In his statement Mr Kelly asserted the view that the European union must “uphold and promote its values and interests” including, “the protection of human rights, in particular the rights of the child”. Overall the event was a very positive and useful gathering, providing a European dimension to the global discussion on the post-2015 development agenda, and once again underscoring the vital work that is required to improve the lives of the worlds most vulnerable children.